This is the last week that you have to enter our F1 2013 sweepstakes! So if you want a free copy of F1 2013, a Casual Cowards t-shirt and stickers, and a Codemasters t-shirt: head on over to Twitter and retweet one of our giveaway tweets. 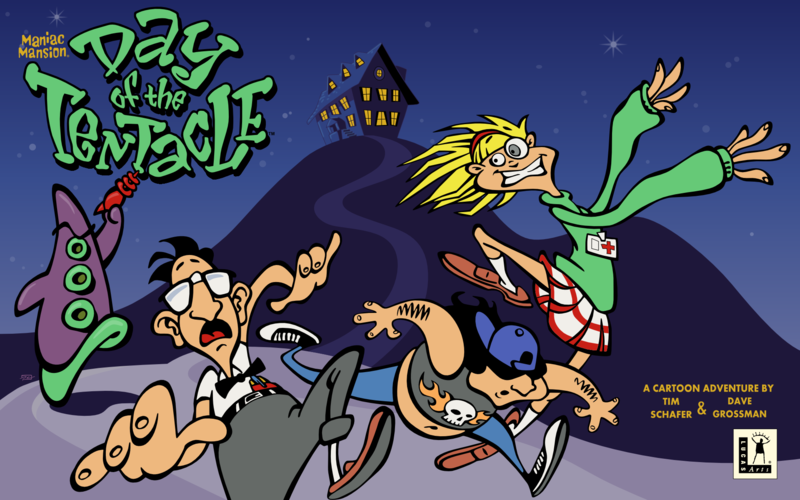 Now that the whoring is out of the way, let’s get to this week’s topic: Day of the Tentacle! Lucas Arts is closed now, and we may never see sequels to classic hits like Day of the Tentacle. And believe me, we’re totally bummed! That’s why we’re paying tribute to this masterpiece, which is the direct sequel to Maniac Mansion. Taking advantage of their SCUMM scripting utility, Day of the Tentacle is a solid addition to the Lucas Arts library. And, as a tribute to the original Maniac Mansion, you even get to microwave a hamster! Not to mention the light peppering of Star Wars references to keep all of the Fanboys happy. Lucas Arts knows who butters their bread. In a quest to save humanity from Tentacle tyranny, three heroes are scattered across time in Dr. Fred Edison’s time machine, the Chron-o-John. From there it’s just one off-the-wall scenario after another. Have you ever wanted to alter the history of the United States by changing the original flag design? How about giving George Washington an exploding cigar? No, that’s not you. You’re the type of person who dreams about destroying a lonely man-child’s most prized possession – just to see what would happen. Well, good news! This was a game that delivered on all fronts! There’s something for everyone! So, sit back and enjoy our ramblings about Bernard, Laverne, and Hoagie in Pointcast 18.1 of the Casual Cowards of Gaming. …AS WE TRY TO TAKE OVER THE WORLD!!!!! !